The Auditorium Theatre’s annual Chicago presentation of Alvin Ailey American Dance Theater will bring a wide array of premieres, new productions, and classics to life on its landmark stage Tuesday, March 8 through Sunday, March 13. Beloved as one of the world’s most popular dance companies, Alvin Ailey’s pioneering legacy of uplifting, uniting, and celebrating the human spirit lives on in the movement of Ailey’s extraordinary dancers. Ticket prices start at $33 and can be purchased online at AuditoriumTheatre.org, by phone at 312.341.2300, or in-person at the Auditorium Theatre Box Office (50 E. Congress Parkway). The Auditorium Theatre will also present a sold-out student matinee on March 11. 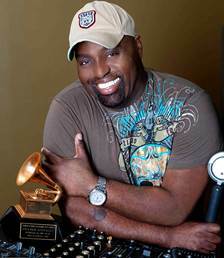 In the News: NEW MOVIE PROJECT TO SHOOT IN CHICAGO ABOUT THE “GODFATHER OF HOUSE MUSIC” FRANKIE KNUCKLES AND THE WAREHOUSE! February 12, 2015 by Soleil! A new feature film, THE WAREHOUSE, will celebrate the Godfather of House Music, GRAMMY Award-winning Frankie Knuckles (1955-2014) and Chicago’s legendary Warehouse afterhours club, where the internationally recognized House Music genre was born. The film will be produced by Bob Teitel (Men of Honor, Barber Shop), Billy Dec (Rockit Ranch/Elston Films), Randy Crumpton (The Truth) and Joe Shanahan (Metro/Smartbar/Double Door). The film will pay tribute to the life story of The Warehouse owner Robert Williams and the legacy of Knuckles’ timeless artistry. Knuckles inspired a movement, transforming the music scene at Williams’ groundbreaking club The Warehouse, with Knuckles’ unique mix of pulsating rhythm and beats, combined with classic disco, soul, gospel and rock, creating modern dance music’s global DJ culture. Williams’ Warehouse, shortened to “House” by its followers, is where House Music got its name. 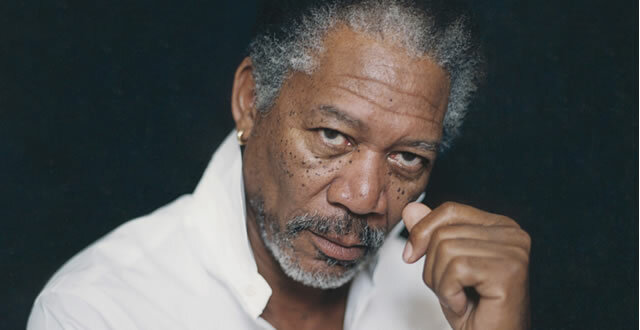 IN THE NEWS: MORGAN FREEMAN TO RECEIVE GENE SISKEL FILM CENTER’S RENAISSANCE AWARD! 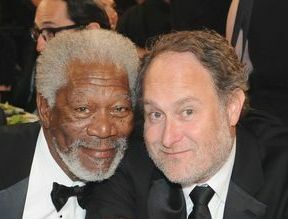 Jon Turteltaub, one of the most successful feature film directors in Hollywood, will lead a candid and thought-provoking conversation with Morgan Freeman at the Gene Siskel Film Center’s 2014 gala, “A Candid Conversation with Morgan Freeman,” on Saturday, June 7. The festive evening will celebrate the Academy Award®-winning actor’s legendary career and give attendees insight into his favorite projects, key influences and creative process. A retrospective of film clips from his most memorable performances will accompany the conversation. The evening will culminate with the presentation of the Gene Siskel Film Center’s Renaissance Award to Freeman by the School of the Art Institute of Chicago (SAIC) President Dr. Walter E. Massey. The gala is co-chaired by longstanding GSFC supporters and Advisory Board members Eda Davidman and Melissa Sage Fadim. All proceeds support the Gene Siskel Film Center’s eclectic film programming as well as lecture series and discussions with visiting scholars and filmmakers. This programming provides the opportunity for students and the Chicago community to experience the best in film presentation. The annual fundraiser is the primary event that ensures that the GSFC can continue to present the highest quality films and film-related events in Chicago. Each year, the Gene Siskel Film Center celebrates the art of film by honoring a filmmaker who advances the art of cinema. Past Renaissance Award honorees have included some of the most respected actors and directors working in the film industry today, including Gwyneth Paltrow, Reese Witherspoon, Jamie Foxx, Robert Downey Jr., George Lucas, Nicole Kidman, Bob Balaban, John Woo, Michael Mann, William H. Macy and Felicity Huffman. The Gene Siskel Film Center of the School of the Art Institute of Chicago proudly presents the Renaissance Award Gala in honor of the Academy Award ®-winning actor and director Morgan Freeman Saturday, June 7 at The Ritz-Carlton Chicago, 160 E. Pearson Street. Single tickets range in price from $500 to $1,000 (VIP). Table sponsorships range in price from $5,000 to $50,000. Call (312) 846-2072 for tickets, tables or more information. A leader in educating artists, designers and scholars since 1866, the School of the Art Institute of Chicago (SAIC) offers nationally accredited undergraduate and graduate degrees and post-baccalaureate programs to nearly 3,200 students from around the globe. SAIC also enables adults, high school students, middle school students and children to flourish in a variety of courses, workshops, certificate programs and camps through its Continuing Studies program. Located in the heart of Chicago, SAIC has an educational philosophy built upon an interdisciplinary approach to art and design, giving students unparalleled opportunities to develop their creative and critical abilities, while working with renowned faculty who include many of the leading practitioners in their fields. SAIC's resources include the Art Institute of Chicago and its new Modern Wing; numerous special collections and programming venues provide students with exceptional exhibitions, screenings, lectures and performances. For more information, please visit saic.edu. Celebrating the life and legacy of Alvin Ailey and his innovative, inspiring and thrilling work, 25 years after his passing, Alvin Ailey American Dance Theater, “long one of the nation's more cherished troupes,” (“Chicago Tribune”) graces the Auditorium Theatre of Roosevelt University’s landmark stage February 28 – March 9, 2014 as part of a 23-City U.S. Tour. Robert Battle returns for his third year as Artistic Director to lead the world renowned company as they continue to inspire and delight audiences with both new work as well as traditional pieces that have made “the Cultural Ambassadors” a staple on the international stage. Tickets ($32 – $92) are on sale now and available online at ticketmaster.com/auditorium, by calling (800) 982-ARTS (2787) or at the Auditorium Theatre Box Office (50 E Congress Pkwy). A Student Matinee performance is offered on February 28, open to any elementary through high school student for $12 each. Student matinee tickets are currently sold out. To be added to the waiting list, please call (312) 341-2357. Artistic Director Robert Battle stands by Ailey’s mission to inspire audiences in a universal celebration of the human spirit using the African-American cultural experience and the American modern dance tradition. 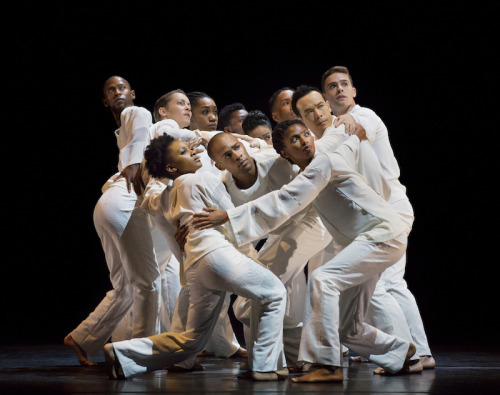 Battle’s vision allows Ailey’s extraordinary artists to push their limits with a diverse repertoire while connecting to audiences on various emotional levels. “Four Corners,” (2013) the fifth work choreographed for Alvin Ailey American Dance Theater by renowned choreographer Ronald K. Brown, brings to life the vision of four angels standing on the four corners of the earth holding the four winds. Set to the music of Carl Hancock Rux, Brown draws inspiration from the lyrics of Rux's "Lamentations," following eleven dancers on a powerful and hope-filled journey of tribulation, devotion and triumph. Know for his signature blend of modern dance and West African idioms in works that often stimulate deeper examinations of spirituality, community responsibility and liberation, Brown’s work has had a significant impact on the Ailey dancers who are now known as inspiring interpreters of his unique dance storytelling. In a program aptly titled Ailey/Ellington, ballets showcasing the marriage of Alvin Ailey’s choreography and Duke Ellington’s music will be presented including “Night Creature” and new productions of “Pas de Duke” and “The River” restaged by Associate Artistic Director Masazumi Chaya. Combining modern dance, classical ballet and jazz, “Night Creature” (1974) is another perfect fusion of Alvin Ailey’s buoyant choreography and Duke Ellington’s sparkling music. Ellington first composed the phenomenal, "Suite For Orchestra" in 1955, later adding the second and third movements in 1963. He said that “night creatures, unlike stars, do not come OUT at night– they come ON, each thinking that, before the night is out, he or she will be the star.” This large ensemble work is full of such stars—strutting, leaping and slinking across the stage. “Night Creature” is the definitive Ailey homage to the exuberance of “The Duke's” jazz, and remains one of his most popular works. “Pas de Duke” (1976) was Alvin Ailey’s modern dance translation of a classical pas de deux honoring two of the most renowned dancers in the world, Judith Jamison and Mikhail Baryshnikov while celebrating the musical genius of Duke Ellington. Last staged for Alvin Ailey American Dance Theater during the 2006-2007 season, “Pas de Duke” was originally presented as part of the festival “Ailey Celebrates Ellington” at Lincoln Center’s New York State Theater in 1976, commemorating the nation’s bicentennial with America’s two great art forms - modern dance and jazz music. Ailey choreographed five sections capturing the sassy sophistication of “The Duke’s” jazz music: the introduction to “Such Sweet Thunder” (1957); the pas de deux to “Sonnet for Caesar” (1975); the male solo to “Sonnet for Hank Cinq” (1957); the female solo to “Unclothed Woman” (1948); and the finale to “Old Man’s Blues” (1930), which captured the exuberance of the star dancers’ qualities and techniques as the male and female soloists mirror each other toe-to-toe and line-for-line in this playful, good-natured competition. “Created especially for Judith Jamison and Mikhail Baryshnikov – reigning stars at the time from parallel worlds of dance—‘Pas de Duke’ showcases so much of Alvin Ailey’s appreciation and ability to showcase great dancers while combining great dance with great music,” said Battle. Rounding out the program is one of Alvin Ailey’s personal masterpieces that has become a signature American classic. “Revelations,” (1960) a suite of dances that fervently explores the places of deepest grief and holiest joy in the soul, will be performed at each performance throughout the two week engagement. The Alvin Ailey Chicago Master Class Series allows both students and adults the unique opportunity to learn from some of the most accomplished dancers working today. Classes take place over two weekends, March 1 and 8. March 1 will feature two FREE high school classes in hip-hop and “Horton Technique.” March 8 will feature an adult master class in jazz technique and costs $20 per person. All classes limited to 30 participants. For more information or to sign up, please email atru-education@auditoriumtehatre.org or call (312) 341-2340. Various other activities are planned during the residency program and will be announced at a later date. (800) 982-ARTS (2787) or in-person at the Auditorium’s Box Office (50 E Congress Pkwy). Discounted tickets available to groups of 10 or more are available by calling (312) 341-2357. There will be a student matinee on Friday, February 28 at 11 a.m. The Ailey student matinee performance is available to elementary through high school student groups of 10 or more. Student matinee tickets are currently sold out. To be added to the waiting list, please call (312) 341-2357. Alvin Ailey American Dance Theater is part of the Auditorium Theatre’s 2013-2014 Dance Series, that also includes Cloud Gate Dance Theatre of Taiwan’s “Songs of the Wanderers” (March 14 & 16), Houston Ballet’s “Aladdin” (March 22-23), River North Dance Chicago (April 12), and The Paul Taylor Dance Company (May 17-18). Dance Subscriptions – discounted at 30% off individual ticket prices - start at only $80 and are on sale now. A Select Your Own Series is also available at a 15% discount. For more information or to purchase a subscription call (312) 341-2357 or visit AuditoriumTheatre.org. For more information, visit AuditoriumTheatre.org. Alvin Ailey American Dance Theater’s 2014 Chicago engagement is supported by Arts Midwest. BET Networks is the Opening Night Sponsor. The Private Bank and The Robert Thomas Bobins Foundation are sponsors of the Auditorium Theatre’s student matinee series, including the Ailey student matinee performance. Alvin Ailey American Dance Theater, recognized by U.S. Congressional resolution as a vital American “Cultural Ambassador to the World,” grew from a now‐fabled March 1958 performance in New York that changed forever the perception of American dance. Founded by Alvin Ailey, and guided by Judith Jamison beginning in 1989, the Company is now led by Robert Battle, whom Judith Jamison chose to succeed her on July 1, 2011. Alvin Ailey American Dance Theater has performed for an estimated 23 million people in 71 countries on 6 continents, promoting the uniqueness of the African‐American cultural experience and the preservation and enrichment of the American modern dance tradition. In addition to being the Principal Dance Company of New York City Center, where its performances have become a year‐end tradition, the Ailey company performs annually at the John F. Kennedy Center for the Performing Arts in Washington, DC, the Auditorium Theatre in Chicago, the Adrienne Arsht Center for the Performing Arts of Miami‐Dade County in Miami, The Fox Theatre in Atlanta, Zellerbach Hall in Berkeley, CA and at the New Jersey Performing Arts Center in Newark where it is the Principal Resident Affiliate), and appears frequently in other major theaters throughout the United States and the world during extensive yearly tours. The Ailey organization also includes Ailey II (1974), a second performing company of emerging young dancers and innovative choreographers; The Ailey School (1969), one of the most extensive dance training programs in the world; Ailey Arts in Education & Community Programs, which brings dance into the classrooms, communities and lives of people of all ages; and The Ailey Extension (2005), a program offering dance and fitness classes to the general public, which began with the opening of Ailey’s permanent home—the largest building dedicated to dance in New York City, the dance capital of the world —named The Joan Weill Center for Dance, at 55th Street at 9th Avenue in New York City. For more information, visit alvinailey.org. The 2014 U.S. Tour is supported, in part, by the National Endowment for the Arts. The company premiere of “Chroma” is made possible in part by the generous support of New York City Center. American Express is the lead funder of “D-Man in the Waters (Part I). The full Auditorium Theatre 2013 – 14 season includes Cloud Gate Dance Theatre of Taiwan’s “Songs of the Wanderers” (March 14 and 16); Houston Ballet’s “Aladdin” (March 22 – 23); Chick Corea and Béla Fleck (April 5); River North Dance Chicago (April 12); “The Idan Raichel Project” (May 15); and The Paul Taylor Dance Company (May 17–18). For a complete listing of events at the Auditorium Theatre, please click here. In one of its most ambitious projects to date, Chicago Opera Theater (COT) will collaborate with the Chicago Jazz Orchestra (CJO) to present the Chicago premiere of Duke Ellington’s only opera Queenie Pie, running February 15 – March 5 at the Harris Theater, 205 E. Randolph Street. Tickets ($35 - $125) are now on sale. Featuring a rousing musical score that blends Ellington’s signature big band sound and clever lyrics with the musical styles of opera, jazz and musical theater, the opera will be conducted by CJO Artistic Director Jeff Lindberg, with direction and choreography by Ken Roht. Originally commissioned by New York PBS affiliate WNET as a television piece for Lena Horne and featuring a libretto by Betty McGettigan, Queenie Pie was unfinished at the time of the Ellington’s death in 1974. Chicago Opera Theater’s production, like the handful of productions mounted by other companies in the past, interpolates additional songs from Ellington’s canon to complete the score, and features a new adaptation of the libretto by Ken Roht, as well as new orchestrations by Jeff Lindberg. The cast of Queenie Pie includes Karen Marie Richardson, best known for her Chicago performances in “Too Hot to Handel: The Jazz Gospel Messiah” in the title role; Anna Bowen as Café O’lay; Keithon Gipson as Holt Faye/King; and Jeffrey Polk as Lil’ Daddy. The conductor is CJO Artistic Director Jeffrey Lindberg; stage direction and chorography is by Ken Roht. The design team includes Danila Korogodsky (sets); Brandon Baruch (lights) and Dabney Ross Jones (costumes). Duke Ellington called his music "American Music" rather than jazz, and liked to describe those who impressed him as "beyond category.” He remains one of the most influential figures in jazz, if not in all American music, giving American music its own sound for the first time. In his fifty year career, he played over 20,000 performances in Europe, Latin America, the Middle East as well as Asia. Ellington is best remembered for the more than 3,000 songs that he composed during his lifetime. His best known titles include "It Don't Mean a Thing if It Ain't Got That Swing", "Sophisticated Lady," "Mood Indigo," “Solitude," "In a Mellotone" and "Satin Doll." 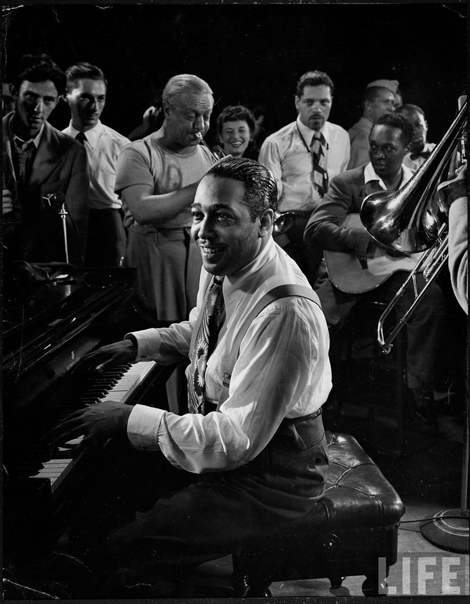 When asked what inspired him to write, Ellington replied, "My men and my race are the inspiration of my work. I try to catch the character and mood and feeling of my people." Duke Ellington's popular compositions set the bar for generations of brilliant jazz, pop, theatre and soundtrack composers to come. While these compositions guarantee his greatness, what makes Ellington an iconoclastic genius, and an unparalleled visionary, what has granted him immortality, are his extended suites. From 1943's “Black, Brown and Beige” to 1972's “Uwis Suite,” Ellington used the suite format to give his jazz songs a far more empowering meaning, resonance and purpose: to exalt, mythologize and re-contextualize the African-American experience on a grand scale. 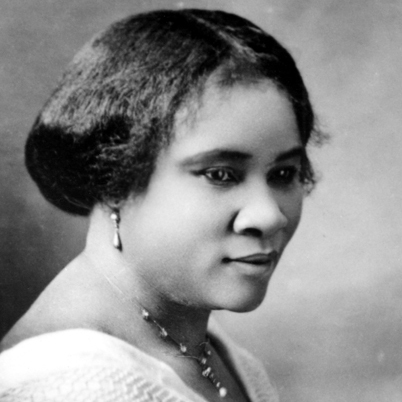 “Queenie Pie” will be performed at the Harris Theater, 205 E. Randolph, Feb. 15 at 7:30 p.m.; Feb. 21 at 7:30 p.m.; Feb. 23 at 3 p.m. and March 5 at 7:30 p.m. Tickets are priced from $35 - $125 and can be purchased by calling 312.704.8414 or via ChicagoOperaTheater.org. Tickets also can be purchased at the Harris Theater box office. The running time is 90 minutes, including one intermission.